Not Charlie Wilson on What is this site all about ? Tom on What is this site all about ? Justice for Pensioners on What is this site all about ? Sorry but is this for real? Who else do we judge then? The question is how much longer will he remain in power? Prison sentences, suspended, for the bank owner and managers recommended by the state prosecutor in her summing up after the month long trial on May 24th 2017. Judges final verdict to be announced on August 28th 2017. The correctional tribunal of Paris withdrew Wednesday to deliberate after three weeks of hearings. Suspended jail sentences and fines were required by the Public Prosecutor against former leaders of LANDSBANKI and LANDSBANKI LUXEMBOURG. Another three months of waiting for the victims of LANDSBANKI LUXEMBOURG, nine years after this bankruptcy was declared. They at least had the satisfaction of hearing the Prosecutor criticize the “OPACITY” opposed to justice by the Luxembourg bank. For the Paris Prosecutor’s office, there is no doubt on the responsibility and guilt of the former management of the subsidiary and the parent bank. The representative of the Republic demanded three years suspended prison sentence and 300,000 euros fine against former boss of LANDSBANKI , Bjorgolfur GUDMUNDSSON, convinced that the former owner of West Ham’s English football club was “FULLY INFORMED” actions of the Luxembourg subsidiary. 100,000 euro fine and three years suspended prison sentence was demanded against two former LANDSBANKI LUXEMBOURG directors , as well as a fine of 1 million euros against the Bank itself. Four former executives were ordered two years probation and 50,000 euros fine if the Tribunal followed the requisitions of the Procureur of the Republic. PANAMA PAPERS at the heart of the Case. The trial revealed the fate of Civil parties identified by the Correctional Court of Paris, according to the order for reference, signed by the investigating judge Renaud VAN RUYMBEKE in September 2015. “by consent to borrowers of collateral guaranteeing of the full amount of the loan, while the bank retained the majority in the Funds and that it provided FALSE information on the modalities of the financial operation, to which the intervention of a ministerial officer gave strength and credit, as well as on its solvency status. Between 2006 and 2008, Landsbanki, already in need of cash, had proposed, through its Luxembourg subsidiary, to hundreds of individuals to mortgage their home in return for loans. The borrower received part of the money while the Bank, carrying a solid AAA, reinvested the rest in stocks and bonds markets, promising to reap interests that would ultimately cover the entire loan. Some victims also discovered during the trial that Landsbanki had opened offshore accounts via the Panamanian Law office MOSSACK FONSECA without their permission, while others had been informed, whilst ignoring that the companies in question were part of an offshore network. It must be said that LANDSBANKI LUXEMBOURG appears in the PANAMA PAPERS, as 9th in rank of banks who created the MOST OFFSHORE companies for customers. The risky venture of Landsbanki is completed in 2010, in the wake of the world economic and financial crisis which led to the nationalization of several Icelandic banks. The investments of Landsbanki also collapsed because of the crisis, leading to ruin for some customers. They were demanded ALL of their loans while they had received only a part of the loan. In case of refusal, they risk seizure of the mortgaged property, threatened the liquidator Yvette HAMILIUS. She, (the liquidator) testified at the French trial, but decided not to make any comments to PAPER JAM . Supported by the Attorney general of State Robert BIEVER at the height of tensions with customers of Landsbanki and with French justice, she (YVETTE HAMILIUS), is still the subject of a complaint for MONEY LAUNDERING , intimidation and harassment filed in April 2016 by a group of the victims, before the Public Prosecutor of the regional Court of Paris. Since Judge Van RUYMBEKE considered that the Equity Release loans were fraudulent , attempts by the liquidator to recover the money borrowed by the Bank’s clients would thereby constitute a MONEY LAUNDERING operation. Victims of Landsbanki rely more than ever on a decision by the Correctional Tribunal of Paris, as the Luxembourg judiciary has dismissed the complaint made by the group of victims for false accounting and criminal conspiracy in December 2014. Will they get a decision, like their fellow sufferers SPAIN did, of having nothing to reimburse Landsbanki if the Tribunal rules FRAUD? The answer will be given on 28th of August. Here is a translation of the above article published by Le Quotidienon May 24th after the summing up by the State Prosecutor. The prosecutor demanded suspended prison sentences and fines against executives of Landsbanki Luxembourg on Tuesday, accused of having swindled hundreds of property owners in France, including singer Enrico Macias. The prosecutor has criticized the “total opacity” against justice by this subsidiary of a major Icelandic bank carried away by the financial crisis of 2008. She requested three years suspended prison sentence and a fine of 300,000 euros against the former head of the Icelandic Landsbanki mother-house, Bjorgolfur Gudmundsson. The prosecutor said that the businessman, former owner of the West Ham football club, was “fully informed” about the actions of the Luxembourg subsidiary. Against the other eight defendants, executives of the bank or business assistants, the public prosecutor asked for prison sentences ranging from six months suspended imprisonment to suspended sentences and fines ranging from 35,000 to 100,000 euros, fine. Not to mention a fine of 1 million euros against the bank itself. The defendants are accused of having, in 2007, swindled about a hundred people in France by having them mortgage their immovable property against a loan paid in part in cash, partly in the form of financial investments. The whole without warning them of the very high risks of the operation, presented as a loan that self-financing. In 2008, on the back of the financial crisis and the nationalization of the major Icelandic banks, Landsbanki Luxembourg went bankrupt and undertook to recover the debts, even if it sold or threatened to sell the mortgaged assets. The prosecutor also demanded Tuesday the confiscation of these claims. The case broke out with the complaint of the singer Enrico Macias. He pledged his villa in Saint-Tropez to Landsbanki Luxembourg, whose liquidator now claims 35 million euros, while he only received 9 million in cash. His lawyer Pierre Haik criticized the prosecutor for having “deserted the audience” and thus allowed a “stigmatization of the victims, designated as the only guilty of their sad fate” for believing Landsbanki’s promises. “We do not play the good of his life at the casino,” said Me Morain, representative of several civil parties, recalling that the customers of Landsbanki were not all fortunate. Defending one of the executives of Landsbanki Luxembourg, Me Olivier Baratelli, considered that this case fell under the civil law, and had “nothing to do in the penal”. “You play the part of the unfortunate in trouble, but I experienced worse misfortune,” he told Enrico Macias, recalling that the singer declared up to 500,000 euros in revenue per year. Baratelli felt that the singer had played a “bad leprechaun” leading the other civil parties to the court. Me Ralph Boussier, defending a client adviser of the Luxembourg establishment, wondered if the civil parties did not seek to make a “white operation using criminal procedure” to erase a bank slate. And so the truth keeps coming out. The disgraceful actions of these men and also of the management of Landsbanki Lu is there for all to see, including Mme Hamilius the liquidator of the Landsbanki Luxembourg Bank. How much more has to be proven before she takes note? 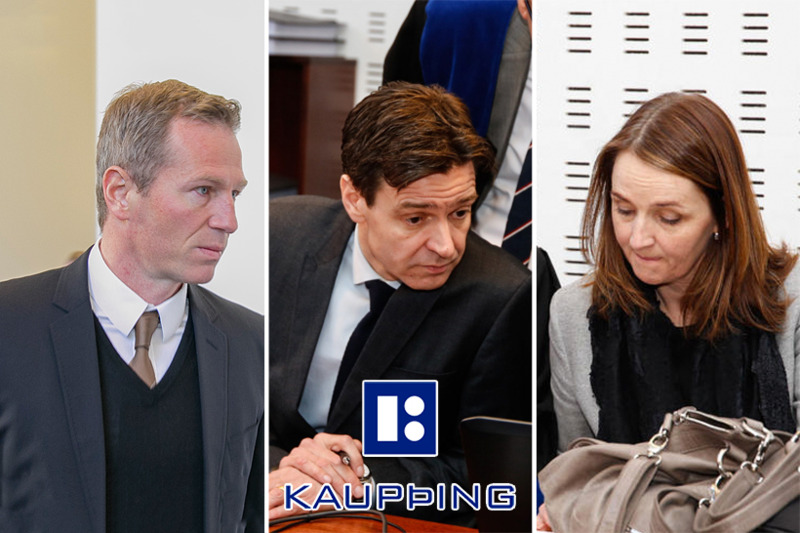 Iceland’s Supreme Court has return a guilty verdict for all nine defendants in the Kaupþing market manipulation case, the court trial for which began in April 2015. Back in June last year, the Reykjavik District Court found seven of the nine defendants guilty, acquitting two. 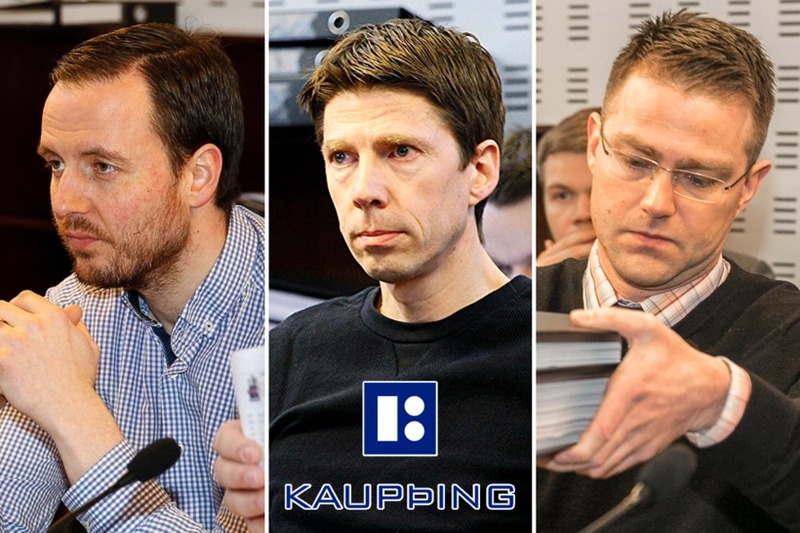 By fully financing share purchases with no other surety than the shares themselves, the bankers were accused of giving a false and misleading impression of demand for Kaupþingi shares by means of deception and pretence. 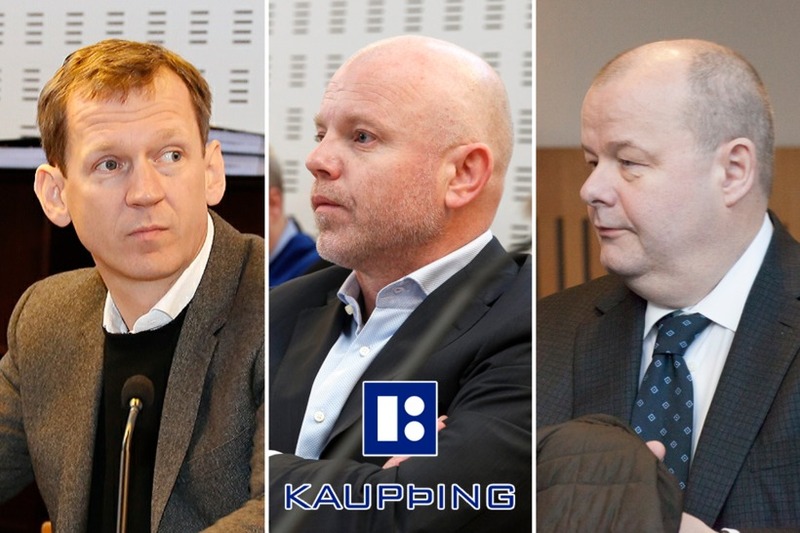 The Supreme Court has now overturned the acquittals, finding Björk Þórarinsdóttir (credit representative at Kaupþing) and Magnús Guðmundsson (former CEO of Kaupthing Luxembourg) also guilty alongside the other seven. No punishment has been handed out to Þórarinsdóttir and Guðmundsson, however. In addition, Hreiðar Már Sigurðsson, former Director of the bank, who had initially received no further penalty, having previously been sentenced in the ‘Al-Thani affair’, has now been given a sixth-month extension to his prison sentence. Twelve clients of Landsbanki Luxembourg have placed a complaint in a French court against the bank, now in administration, and its administrator Yvette Hamilius. This is the culmination of a struggle over many years where a group of Landsbanki Luxembourg’s clients, who took out equity release loans with the banks, have been claiming that in spite of overwhelming evidence, i.a. criminal charges in Iceland, about the bank’s operations Hamilius has done nothing to investigate these matters. In addition, the clients claim she has harassed and intimidated them. Further, not only has she taken no notice of charges brought in France last September by Justice Renaud van Ruymbeke against the bank, its directors and employees but has indeed chosen to discredit them publicly in Luxembourg media. As reported in the Luxembourg paper PaperJam, the complaints against Hamilius also concern money laundering since the charges in the van Ruymbeke case refer to fraud. The saga of Landsbanki Luxembourg, its equity release loans, its other operations, the behaviour of the bank’s administrator and the unwillingness of the Luxembourg financial regulator, Commission de Surveillance du Secteur Financier, CSSF, to investigate both the bank’s operations and then the administrators is a long and sad saga, which has often been brought up on Icelog (see earlier blogs here). It can’t be said often enough – and I say it yet again – that it is impossible to understand the operations of the Icelandic banks without scrutinising their Luxembourg operations. Given the fact that managers and employees of all the three largest Icelandic banks have been investigated in Iceland and in some cases sentenced to prison and given that almost without exemption Luxembourg figures in these cases it is incomprehensible that the CSSF has not taken up a single case related to these banks. The CSSF has recently set up a new office to protect the interests of depositors and investors. This may sound like good news, given the tortuous path of the Landsbanki Luxembourg clients to having their case heard in Luxembourg; CSSF has so far been utterly unwilling to consider their case. Interestingly, it’s the magistrate ruling on the Landsbanki administration Karin Guillaume who has been chosen to fill this post. As pointed out in PaperJam Guillaume has been under a barrage of criticism from the Landsbanki clients due to her handling of their case, which somewhat undermines the no doubt good intentions of the CSSF. In addition, there is of course now the insight via the Panama leak into the operations of other banks in Luxembourg. When will the authorities in Luxembourg acknowledge that the many stories of financial malfeasance in the Duchy are a huge and ugly stain on this pretty little state at the heart of Europe? And when will other European countries bring enough pressure on the Duchy to confront the facts of the financial sector in Luxembourg: part of it is placed exactly there full well knowing that nothing seems sordid enough to wake the CSSF up to this disgraceful reality. La plainte du collectif des victimes intervient une semaine après la démission du Premier ministre islandais, cité dans l’affaire des Panama Papers. Le collectif des victimes de Landsbanki Luxembourg a tenu parole et a déposé mardi 12 avril une plainte pour blanchiment, intimidation et harcèlement auprès du procureur de la République du tribunal de grande instance de Paris, contre la banque et sa liquidatrice, l’avocate Yvette Hamilius. Le collectif des victimes de Landsbanki Luxembourg, réduit aujourd’hui à 12 parties, a engagé une plainte en France auprès du procureur de la République du tribunal de grande instance de Paris contre la banque luxembourgeoise et sa liquidatrice, l’avocate Me Yvette Hamilius. Déposée le 12 avril, la plainte reproche à la liquidatrice d’avoir tenté «à diverses reprises de réaliser le produit de l’action criminelle détenu par la société Landsbanki Luxembourg en liquidation». Car la banque luxembourgeoise a été renvoyée à l’automne 2015 devant un tribunal correctionnel en France pour escroquerie, après y avoir commercialisé auprès de centaines d’épargnants des prêts toxiques connus sous le nom d’equity release. Le juge d’instruction français Renaud Van Ruymbeke avait considéré que les montages equity release relevaient de l’infraction d’escroquerie. Le fait que la liquidatrice initie des démarches en France et au Luxembourg pour récupérer l’argent emprunté par les clients de la banque constituerait de ce fait une opération de blanchiment. Les avocats des victimes, MMe Maxence Laugier du Barreau de Lille et Bernard Maingain du Barreau de Bruxelles, considèrent que la banque et sa liquidatrice ont posé des actes susceptibles d’être qualifiés de «discrédit de la justice», «intimidation de la victime», «blanchiment et tentative de blanchiment», «tentative d’escroquerie à jugement» et «harcèlement». «La banque Landsbanki Luxembourg s’est appropriée, à la suite d’une escroquerie, une créance et diverses garanties au préjudice des victimes», notent les avocats. «À ce stade de la procédure pénale impliquant un renvoi devant le tribunal correctionnel à Paris, la liquidatrice de la banque Landsbanki Luxembourg ainsi que cette dernière essaient, par divers procédés frauduleux, de percevoir sur les comptes de la liquidation des sommes d’argent à charge des victimes en réalisant, en fin de compte, les actifs frauduleusement engagés ou en exécutant la créance frauduleusement acquise», poursuivent-ils. Le collectif des victimes reproche en outre à l’avocate luxembourgeoise ne n’avoir «aucune attention» à leur égard, et d’avoir «multiplié les procédures en se prévalant de créances dont la validité est éminemment contestable compte tenu de l’état d’avancement des procédures pénales». Reste à voir le sort que le pôle financier de Paris fera de cette plainte, alors que le nom de la banque a été abondamment cité dans l’affaire des Panama Papers, provoquant la démission du Premier ministre islandais Sigmundur David Gunnlaugsson. Contactée par Paperjam, Me Hamilius, occupée par une audience, n’était pas en mesure de commenter cette annonce. Former Landsbanki CEO Sigurjón Árnason and three of his subordinates were sentenced today in the Supreme Court of Iceland for market manipulation, RÚV reports. Sigurjón received an 18-month prison sentence, in addition to the three and a half years he already received in the first part of the case, the so-called Imon Case, in October of last year. Thus, his sentence has been extended to five years. In addition to Sigurjón, Ívar Guðjónsson, former head of proprietary trading at the bank, Júlíus Steinar Heiðarsson and Sindri Sveinsson, former subordinates of Ívar, were accused of across-the-board market mismanagement, for keeping share prices high by purchasing large numbers of the bank’s shares for almost a year before the financial crisis. Ívar received a two year prison sentence, Júlíus received one year in prison and Sindri nine months. The Supreme Court’s sentences were all heavier than those which the accused had received in the Reykjavík District Court. FROM THE ERVA.ES WEB SITE 11th October 2015.